New York: US Senator Kirsten Gillibrand, a Democrat from the state of New York, has announced running for President in 2020 and said that her campaign would lean heavily on gender issues and imagery.Appearing on CBS' "Late Show" that was aired on Tuesday night, 52-year-old Gillibrand told host Stephen Colbert that she believes she has "the compassion, the courage and the fearless determination". "The first thing I would do is restore what's been lost: The integrity and the compassion in this country... I would bring people together to start getting things done." 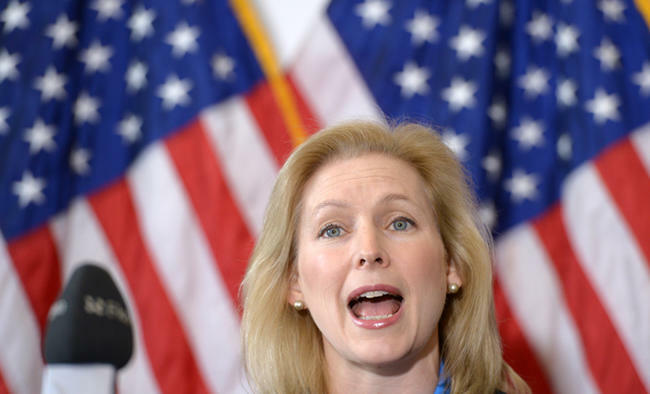 Gillibrand said she was forming an exploratory committee, an essential legal move that will allow her to begin raising money to compete in the Democratic primary before the 2020 election. "I'm going to run for President of the US because as a young mom, I am going to fight for other people's kids as hard as I would fight for my own," she told the programme.Gillibrand is well known for her efforts to combat sexual assault in the military and on college campuses, to repeal the military's policy of "don't ask, don't tell" and to make it easier for Capitol Hill staffers who had been sexually harassed or assaulted to report their experiences. She has been a champion of women's rights including in the #MeToo movement and is also a vocal critic of President Donald Trump. She voted against his political appointees and positions at a higher rate than most Democrats. The President had attacked her in a tweet last month by calling her "a sexist smear". Gillibrand said that she supported universal healthcare, better public schools and job training programs. "But you are never going to accomplish any of these things if you don't take on the systems of power that make all of that impossible," she said. "I know that I have the compassion, the courage and the fearless determination to get that done," she said in the interview. Gillibrand is the third woman so far to seek the nomination within the Democratic Party, following Senator Elizabeth Warren of the state of Massachusetts, and Tulsi Gabbard, Hindu Congresswoman from Hawaii.Gillibrand, a former corporate lawyer, took the Senate seat of Hillary Clinton in 2009 when the latter became Secretary of State. She was re-elected in last November's mid-term elections to another term.